The work of a firefighter can be dangerous but the services these community helpers provide is both necessary and invaluable. Not only are they sometimes on call to respond to fires, but they also serve to rescue and account for potential victims inside a burning blaze. In addition, firefighters are often called to assist with the cleaning up of spills relating to accidents related to vehicles carrying hazardous materials. Firefighters also can be called to employ the use of their hydraulic rescue tools, otherwise known as the Jaws of Life, to extract accident victims from their automobiles. When necessary, firefighters will administer first aid, rescue breathing, and cardiopulmonary resuscitation to wounded persons. They are also sometimes asked to help with the removal of water during floods from basements. In the event of an in-depth search and rescue mission, police will ask for assistance from local fire crews. Firefighters tend to spend a great deal of time at the fire station occupied in various duties. They will ride to a situation in a fire truck and can find themselves in a variety of locations, including structure fires, accident scenes, and private residences assisting in cleanup work. It goes without saying that firefighters will find sometimes themselves in risky situations, fighting fires and dealing with toxic fumes. is the average yearly salary for firefighters. have a Post-Secondary certificate while 31% have some college, but no degree. 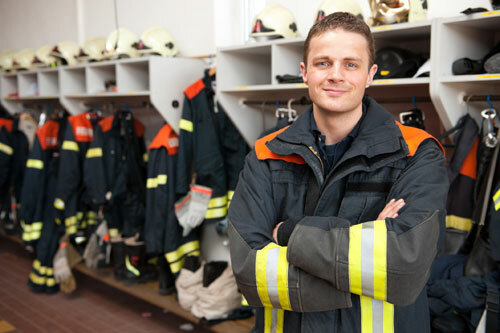 A firefighter needs to have earned their high school diploma or GED, and they need to have received additional instruction in emergency medical services. Prospective candidates must attend classes at a fire academy, and they must complete a series of rigorous physical and written tests. In addition, they must hold a certification of emergency medical technician training. The median annual salary for firefighters was $46,870, or $22.53 per hour in May 2015 according to the BLS.gov. The lowest 10% earned $23,010, and the highest 10% earned $79,490. This data was collected for the year 2015. The projected growth for firefighters is average to that of most professions, at 5% to 8%, and there are currently 327,000 people who are employed in this occupation. It is estimated that an additional 112,300 will find employment as firefighters in the next 8 years. Firefighters are to respond to calls from dispatchers and travel to burning residences or commercial buildings. They are to locate a water source and put out fires and are to assist in the rescue of anyone who may be trapped inside. Firefighters are to keep fire stations in good, working order and are to maintain apparatus when not in use fighting fires.